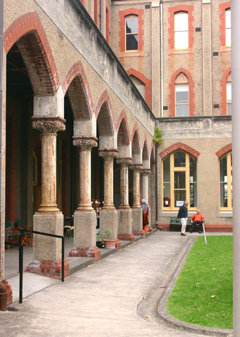 The Abbotsford Convent is a community run arts and cultural centre - a hub for artists, artisans, sculptors, writers, and wellbeing practitioners. With its restaurants, cafe, markets, festivals, performances and radio station, it's a little world of its own. It is located next to Collinwood Children's Farm in the iconic buildings of a former convent. It is surrounded by formal gardens and is next to rural farmland along the Yarra - only 4km away from the city centre. The convent is huge. It is the largest of former Victorian convents, with impressive architecture - some of it French medieval - and a large range of interesting buildings. From 1860s until 1975, it was run by the Sisters of the Good Shepherd to provide refuge, food and work for thousands of women, girls and orphans, particularly during the difficult times of the 1890s and 1930s. The convent has been saved from developers in recent years by an all out community effort, and has maintained its culture by voluntary work, donations, good business, philanthropists and Government support. It is a hub of activity and one of our favourite places for weekend coffee. 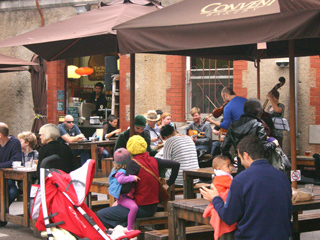 It's a great setting, lovely people, often has live music and a great coffee and food. 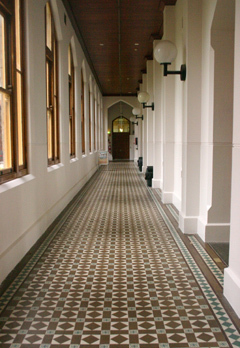 The artists in the convent are chosen to represent a variety of disciplines such as digital media, literature, visual arts, performance, music, education, architecture and design. There are small studios in the former bedrooms of the Convent building. This is where you find the quiet artists such as the writers, film-makers, visual artists and composers, as well as some cultural organisations. The Mercator building houses larger studios, suitable for the 'hard' arts, such as print makers, jewellery, ceramic and furniture design artists. The wellbeing centre is located in the west wing of the Convent building, with a large range of health practitioners - Acupuncture, Alexander Technique, Yoga, Aryurveda, Feldenkrais, Homeopathy, Kinesiology, Massage, Shiatsu and more. 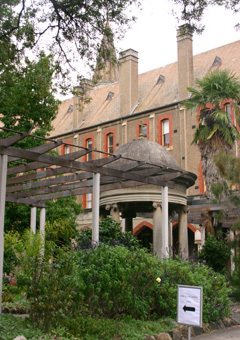 You can hang out at the Abbotsford Convent or wander through the beautiful heritage gardens. It's a vibrant and active community. There is also a community radio station, chocolate makers, and many other craft people whose works you can admire in the grounds. Then there is a Contemporary Art Space showcasing the work of emerging and established contemporary artists. They have a full a calendar of exhibitions within its three galleries throughout the year. There artists will find support and professional opportunities at all stages of their careers. The Sophia Mundi Steiner School also runs its classes at the Convent, and there are holiday activities for the kids. You won't go hungry at the Convent. You can get great coffee, food and wine. and there are several restaurants and bars, and a bakery. The not for profit Lentil as Anything is a multicultural vegetarian restaurant that is operated by volunteers on a pay-as-you-feel model. It provides support and training to young migrants and refugees and positive community development. The Abbotsford Convent is hosting a growing number of workshops, classes, such as dance and yoga. There are also regular markets, such as a regular farmers market, and during summer a vibrant night market. It is at any time a hub for community activities and performances.